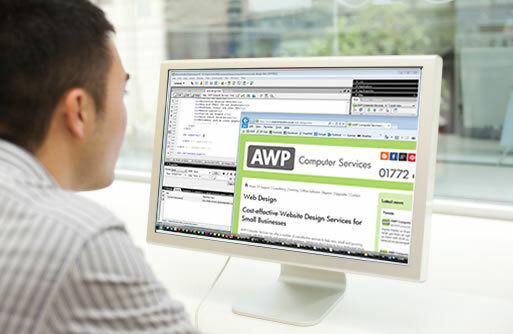 AWP Computer Services can offer a number of cost-effective services to help new, small and growing businesses with their website and general web presence. Whilst we don’t claim to be a dedicated Web Agency, we feel that we’ve got the know-how, gained after more than fifteen years of working with the Internet, to help you make the right decisions for your business at the right budget. In fact, when we started working with the web, Websites were still called ‘Web Sites’! Reluctantly, we’ve followed the rest, in the one word naming convention, but don’t be surprised to see us describing them in two words accidentally (on purpose) from time to time. Whether you already have a web site and just want a few tweaks, have an established domain name and want a new site or haven’t started yet and want to make sure you start off on the right footing, we’re here willing to help and advise. Please feel free to give a call today, or contact us through the form on our website, to discuss how AWP Computer Services can help you out with your web project. As well as doing the Web Design, SEO (Search Engine Optimisation) and Hosting for the AWP Computer Services website [our own website], we also work on a number of websites for Small Businesses in the local area. If you are on a tight budget and you’re really not sure where to start, or feel you don’t have the necessary time or skills to progress, why not give us a call today to see how we can help you? From getting your own domain name, to setting up the website, designing the pages, authoring the content and making everything work (the way you want it) with email accounts on the same domain, AWP Computer Services can help your businesses every step of the way. Alternatively, if you’ve figured most things out and there is only a few certain specific points you need help with, we’d be more than happy to lend a hand. As Part of our website support service, we work with two of the most popular open source Website Content Management Systems, which are Joomla! and WordPress. We have developed a number of new websites for our clients on the Joomla! and WordPress platforms. We have also worked on a number of version updates (upgrades) on both Joomla! and WordPress. Whilst using Joomla! and WordPress open source content management systems can be a cost effective way of creating a small business website that is easy to maintain, from a security point of view, it is important that you keep the versions up to date. Often the version updates are quite strightforward, and use the ‘one click upgrade’ approach, which be easy enough for any end user to carry out. However, sometimes the version updates between older versions and the current ones are quite major, with significant changes to the systems making the process very involved. This will mean that you are likely to need the help of somebody like AWP Computer Services, who have the experience and technical know-how to implement the necessary changes. If you would like more information about how AWP Computer Services can help you with your Joomla! and WordPress open source content management systems, please see our Joomla! and WordPress specific page. Alternatively, please feel free to give us a call today, or contact us through the form on our website, to discuss how AWP Computer Services can help you out with your Joomla! or WordPress web project.